We decided it was time to let you know we are still alive. We just haven’t wanted to bore you every day. It is still really hot in Tuscaloosa. Last night at 8:00 we were ready to go for our evening 3 miles and looked and it was still 92 degrees with 100 degree heat index. We did walk outside but quickly decided it was just too hot for a serious walk. We strolled around a bit but just couldn’t bring ourselves to do another 3 miles. We try to do 15 minute miles so even tonight when it was a cooler 89, it was a sweaty 45 minute walk. Tonight took a little longer because before heading back to the house, we stopped at Cookout for a couple of shakes. We tried a Snickers shake for the first time tonight and it was really good. We will be buying that one again. 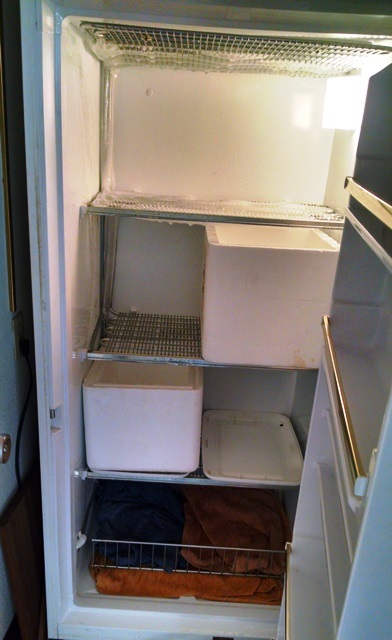 You know we haven’t been doing anything interesting when we show you a picture of a freezer defrosting. The rest of the past three days we were cleaning out some cabinets, refrigerator and doing a lot of accounting. That’s about it. Hopefully things will improve soon.